When a 14-year-old is killed, it usually does not make national news. 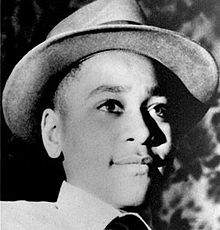 However, in 1955, the kidnapping and murder of 14-year-old Emmett Louis Till in Money, Mississippi, continues to make headlines. lam and Bryant were tried and acquitted by an all-white, all-male jury. The jury deliberated for a little over an hour and returned the innocent verdict despite overwhelming evidence that the defendants were guilty. and were never brought to justice. drove to Glendora, Mississippi to a shed located behind Milam’s home and pistol-whipped him. Till, whose nickname was Bobo, lived in Chicago, Illinois. He traveled to Mississippi to visit relatives and stay at the home of his great-uncle Mosses Wright. Four months after their trial, the two- white men from Mississippi, recounted in the January 1956’s “Look” magazine how they beat Till with a gun, shot him and threw his body in the Tallahatchie River with a 75-pound cotton-gin fan attached with barbed wire to his neck to weigh the body down. They were allegedly paid $1,500 each for the interview and could not be tried again because of the Double-Jeopardy Clause. On Aug. 24, he went into Bryant’s Grocery and Meat Market to buy candy. At some point, he allegedly whistled at Carolyn Bryant, a white woman who ran the store with her husband Roy who was away at the time. She claimed Till grabbed her, made lewd advances and wolf-whistled at her as he sauntered out. Till’s mother ordered the top of her son’s conflicted, so people could see his horribly damaged face. “Let the people see what they did to my boy!” she said. Crowds estimated in size from 10,000 to 50,000 descend on the Chicago funeral home. Once they arrived at the Tallahatchie River, they shot Till and threw his body in, according to the “Look” magazine interview. His harmless action carried weight in an era of segregation and Jim Crow laws that ruled the South. Four days later, Till, who was black, was abducted from his great-uncle’s house by J.W. Milam and Roy Bryant. The facts of his murder are murky and unsubstantiated. Three days after his death, his corpse was recovered, but so disgured that his great-uncle could not identify him except for an initialed ring. Hundreds of thousands of people, mostly in northern cities, attended rallies protesting the verdict in the Till-murder trial. In Mississippi, membership in segregation-supporting White Citizen’s Councils skyrocketed. The burial was postponed to allow additional time for the public to view Till’s body. Meanwhile, largely in response to the national attention the case attracted, people in Mississippi decide to use the trial to send a message to outsiders. All five lawyers of the town of Sumner, Mississippi, agree to defend Bryant and Milam. The sheriff is not convinced that the body pulled from the Tallahatchie River was really that of Till. The FBI’s evidence reveals a number of inconsistencies and differences in its nine-page report.